• Increase effectiveness of the leaders, the individual and the team. • Energize teams and shift perspectives to positive growth and efficient, constructive action. • Employ a common, extraordinarily powerful language between the leadership and the team. 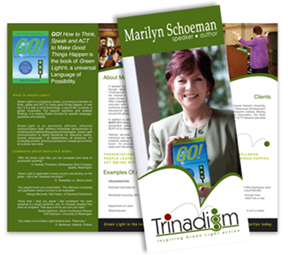 • Generate superior results by moving forward together – in a unified, remarkable way. • Develop a collaborative environment, a sense of community and a Green Light culture. • Direct the focus away from obstacles, barriers and pitfalls toward key goals. • Uncover and harness the greatness of team members. • Expand personal responsibility, contribution and performance. • Create an immediate change in mindset that opens new doors and reveals new options. • Avoid getting stuck on what is taken away; explore what can be added, revised or renewed. • Position change: to avoid creating anxiety, present it as an opportunity. • Empower everyone in the equation to be a positive part of the adjustment, the new creation. • Build people’s confidence in their ability to flex with the times, with the situations. • Unleash the power of language: innovate using the Language of Possibility. • Unify different areas of expertise, under one banner and toward a common goal. • Generate fresh viewpoints and better questions that support the novel/the new ideas. • Promote creative cross-fertilization of ideas, build momentum – and excitement. • Illuminate opportunity and foster ownership and connection to the work community. • Establish a work environment that people look forward to participating in. • Equip people and assist them to interact constructively, supportively. • Reduce negativity, foster resilience and promote cohesiveness. Gratitude and Appreciation – Powerful Partners for Communicating and Connecting. • Gain awareness of how to appreciate, celebrate and connect more fully with the important people in your world. • Have fun encountering this lively, dynamic and profound mix of self-replenishing and rejuvenation. • Experience appreciation and gratitude in new Green Light ways. These two qualities are key elements in growing relationships – and relationships are key to living life richly. As a home engineer, caregiver, entrepreneur or employee, these skills positively impact your connect-ability. They grow community and add to your sense of satisfaction and fulfillment. Come as you are – and leave with a newfound appreciation for yourself and others and a future enhanced.